Sell a man a PRODUCT, he'll use it for a day. Sell a man an IDEA, he'll believe for a lifetime. Content strategy - Who are your customers? If you try to sell to everyone, you won't sell to anyone. Content strategy starts with a simple yet difficult question: Who are your customers? When we begin to tease out the intricacies of that answer, it becomes more obvious what types of content we should make, and where that content should live. Authenticity - Who are You? The average consumer is overwhelmed by companies shouting for their attention, and the natural response is to tune out everything. But this market also creates opportunity for staunch loyalty. If you can show people what you stand for, what you believe in, the "Why" of your company -- you'll gain lifelong customers that are your best referral engine. This ties back to our Content Strategy and understanding who your brand resonates with. 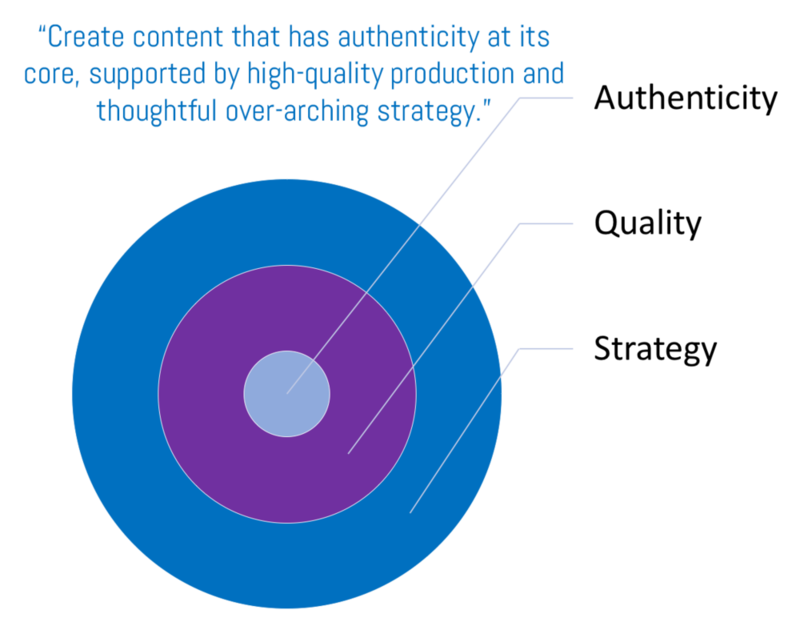 The bridge between authentic branding and targeted customer marketing is high quality content. You can't just understand your Brand and your customers. You need to prove it. The idea isn't enough. You need to build it, and make it so beautiful and powerful that they can't look away. They have no choice but to buy this product that was made just for them. Quality also implies quality. A video with poor audio or a website riddled with typos must represent a low quality product. Quality begets quality begets sales! Pete tears up about how realtor Keith Duble helped find their dream home. Image from Customer Testimonial video for Keith Duble, 2015. I want to create genuine marketing content. You might know exactly what your content game plan is, or you might have no idea. Wherever you are, that's where we'll start! You know your company and your customers best, so we'll begin with your insights to develop a content strategy for your specific business. Then we'll turn that strategy into an actionable, content-driven plan. And then I'll create the magic for you! But my job doesn't end when I send you the video files. I'll help you set up a process for measuring the effectiveness of your content strategy, so we can learn and revise going forward! You can more effectively show your personality and authenticity in video content. Image from AMP Vapor commercial, 2015. Video is one of my specialties. I've worked as a video producer and editor since 2008, creating high quality and strategy-driven videos for a variety of projects. Your website is often the first interaction that potential customers have with you. Does your content draw them through the sales pipeline? Are you creating keyword-rich blog content and social media posts that attract new customers? Check out my Marketing Writing Samples. How do you on-board new team members quickly? Can your sales and support teams confidently answer every question? Are you losing customers because they don't understand your product? Education is an often overlooked yet extremely vital piece of any successful business. An effective training program will increase sales, cut costs, and retain customers. Knowledgeable employees are better equipped to market, support, and sell your product. Informed customers are happy customers, not drowning in product confusion or apathy. Learn more about Training Offerings. I'm an experienced video producer and writer, and I love experimenting with new and beautiful Marketing ideas. If you have a half-idea that you want to flesh out, or a problem that you can't quite work out, send me a message! I love creative troubleshooting and strategizing, and I have a history of being pretty good at it too!